SwiftKey Keyboard has released an update. Version 5.1.2 of SwiftKey offers the opportunity to give your keyboard a Christmas atmosphere. In addition, there are several bugs fixed it and made optimizations. 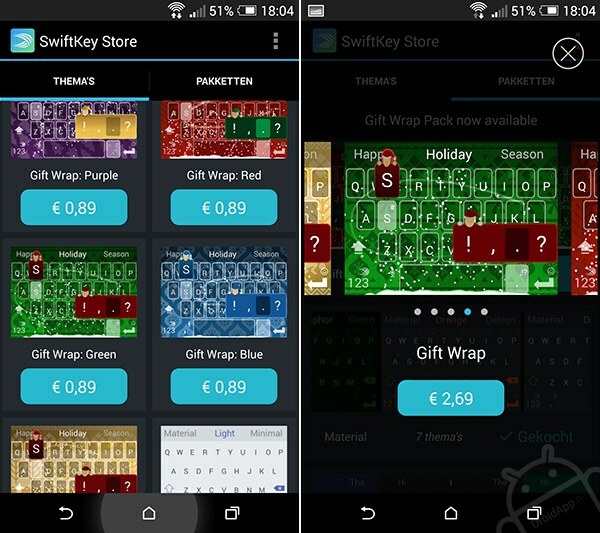 SwiftKey 5.1.2 adds five new themes as 'Gift Wrap'. With this new Christmas themes give you a decorative touch to your keys, and each has its own motive. The new themes are according to the developers in the style of wrapping paper. The new winter themes are found in the SwiftKey Store. A separate issue costs $0.89 and a package with all five new themes costs $2.69.